On June 25, a shipment of 241 African grey parrots arrived at Johannesburg International Airport, purportedly from a breeder in Dubai. Sealed inside several wooden boxes, the birds passed through customs without being inspected by conservation officials, a breach of import regulations. The importer was a retired state attorney and an executive member of the Parrot Breeders Association of South Africa, Dieter Horstmann. He drove his parrots to a private quarantine facility that afternoon. Horstmann’s troubles began a month later. Since 1982, the commercial trade in African grey parrots has been regulated, in theory at least, by CITES, the international treaty for protecting endangered wildlife. Grey parrots are among the world’s most popular avian pets, principally due to their ability to mimic human speech, but may soon face extinction in the wild, following decades of overexploitation. Their listing on Appendix II of CITES imposes conditions on exporters to prevent unsustainable trade – a system that isn’t working, according to conservationists seeking to tighten controls further at the 17th CITES Conference of the Parties (CoP17) in Sandton this week. Yet it was their current CITES status that led to Horstmann’s parrots being confiscated in July, on suspicion that they had been poached in central Africa. Dr Chris Kingsley, a specialist wildlife veterinarian, runs the quarantine facility where Horstmann delivered his birds. Grey parrots are susceptible to disease in captivity, and breeders isolate new stock to avoid contagion. Three of Horstmann’s parrots had died in quarantine, but the rest were healthy, and Kingsley informed Horstmann that he could collect them on July 25. Four days before this release date, officials from the Department of Environmental Affairs intervened. The notice states that Kingsley’s staff “[failed] to produce the original CITES permit” for the parrots. This raised “reasonable suspicion that there [had] been a breach of the law” by Horstmann. It was a technical complaint, based on CITES regulations. To export any species listed on Appendix II, wildlife traders must first apply for a permit from their local CITES authority. This permit is supposed to prove that the shipment has been sourced legally, without threatening the survival of the species. In some instances, importers must then apply for a permit from their own CITES representatives. This is the case with grey parrots in South Africa. When the documentation is ready, the shipment may proceed, accompanied by its original export permit. Upon collection, the importer must submit their corresponding permit – also original – to a CITES official at customs. After inspecting the shipment and both documents, the official may sign off on the transaction. For some reason this final check didn’t take place with Horstmann’s parrots, although both permits had been issued. Inspections are a bureaucratic process-prone, on occasion, to administrative error, but the department’s initial grievance soon led to more serious doubts about the parrots’ provenance. Sources close to the investigation that ensued say that the birds were found to be infected with blood parasites from central Africa. It is possible that these test samples had been contaminated, producing a false result. The birds were all adults – unusual, when almost all breeders export juveniles. They wore removable leg rings, not the closed identification bands breeders typically favour. They seemed terrified of humans. And they travelled in a surprising direction – from the Middle East, a net importer of grey parrots, to South Africa, the world’s biggest exporter. Taken together, this information suggested that Horstmann’s parrots may have been caught illegally in the wild and “laundered” via Dubai. The pet trade has had extremely severe consequences for wild African greys. In Ghana, for instance, where the species was once widespread, populations have declined between 90% and 99% since the early 1990s, according to a study published earlier this year. There was no evidence that declines had been less severe elsewhere in West Africa, the authors wrote, attributing the losses to ongoing trapping and habitat destruction. Troublingly, Ghana had imposed a ban on grey parrot exports for the entire duration studied, meaning that thousands of parrots had been traded illegally. Just 35 grey parrot exports were reported to CITES – two per year – during a period in which the species was “virtually eliminated” from the wild. But while grey parrots have disappeared from their natural range, which once spanned the forests of equatorial Africa, a new, somewhat surprising source for the pet trade has emerged: South Africa, a country with no wild grey parrots. Grey parrots can be bred in captivity, and in the past two decades South Africa has developed the largest grey parrot breeding industry in the world. Today, seven of every eight captive-bred grey parrots sold globally come from South Africa, according to trade statistics. Since 1998, South Africa has exported more captive-bred African Greys annually than the rest of the world combined. The Parrot Breeders Association of South Africa (PASA) says their industry, which comprises more than 1,630 breeding facilities, produces some 67,000 chicks a year, or 183 chicks daily. Almost 90% of these chicks get exported, predominantly to Southeast Asia and the Middle East. With grey parrots fetching an average of $300 (R4,000) each, the industry is worth more than $18-million (about R245-million) a year. It employs more than 1,500 workers. According to PASA, captive breeding reduces pressure on wild grey parrot populations. Global export statistics reveal a marked shift from wild-caught to captive-bred grey parrots in the past 20 years. But poaching has not slowed in response. In the Democratic Republic of Congo (DRC), for instance, more than 7,000 grey parrots have been poached since January, observers say. CITES suspended all grey parrot exports from DRC in January due to ongoing compliance issues, a penalty that had little impact on illicit trade. Listing on Appendix II is supposed to ensure sustainable use, but traders frequently exploit loopholes to exceed quotas. Between 2007 and 2015, according to trade statistics, exporters in Africa shipped 28,721 more wild grey parrots than their quotas allowed. Almost 3,000 wild grey parrots were shipped from countries with zero quotas. More than 15,000 parrots declared as captive-bred came from countries with no known commercial breeding facilities. To overcome these sorts of problems, conservationists are supporting a proposal to transfer grey parrots to Appendix I at CoP17. An Appendix I listing would outlaw all commercial trade in wild grey parrots. “Current harvesting practices are unsustainable and leading to population collapses,” said Rowan Martin from the World Parrot Trust, a conservation group supporting the motion. “The transfer to Appendix I cannot come soon enough. Without urgent protection, the remaining strongholds for the species will suffer the same fate of grey parrots in West Africa. The South African breeding industry is opposing the ban, even though its members would be allowed to continue trading after registering their facilities with CITES. During the debate, PASA representatives will argue that an Appendix I listing would be detrimental for wild populations. For an industry attempting to justify its conservation credentials, the confiscation of Horstmann’s parrots came at an inconvenient time. 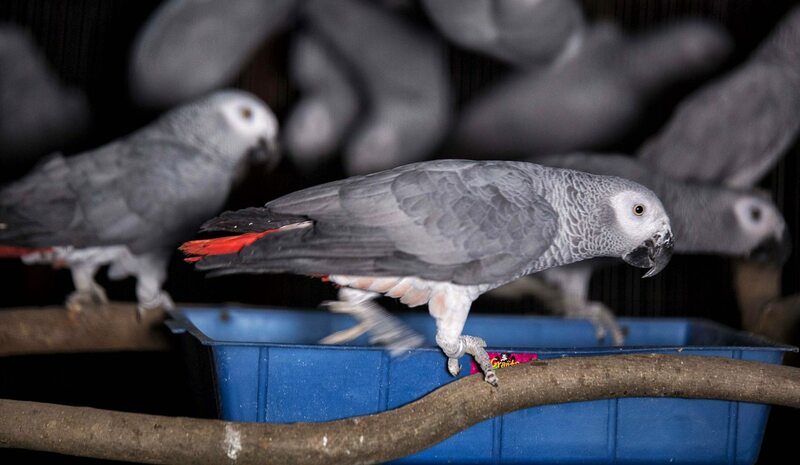 South African breeders have been linked to illegal grey parrot shipments in the past. In 2011, 730 wild grey parrots died in transit after being imported from the DRC. The exporter, Martin Byart from Kinshasa, is registered as an adviser to the DRC delegation at CoP17, and was present at the Sandton Convention Centre this week. Byart was the listed recipient of multiple illicit shipments confiscated in the DRC this year, including more than 400 parrots in January and 120 parrots in July. In 2014, Byart exported 33 “bushmeat orphan” monkeys to controversial South African wildlife trader Mike Bester, a founding member of PASA. Historically, South African aviculturists imported wild grey parrots for breeding. It is cheaper to breed with wild birds – captive-bred chicks take at least four years to reach maturity, requiring food and shelter – and cheaper still to sell wild parrots falsely as captive-bred. Industry critics say this has created incentives for breeders to cheat. “There was a period when many birds were being laundered here,” said William Horsfield, a breeder who quit the parrot trade out of concern over the treatment of pet birds. Grey parrots breed best in dark, confined spaces; some local facilities, dubbed “parrot mills”, keep more than 1,000 birds in individual cages measuring less than one cubic metre. In an urgent High Court application in Pretoria last month for the immediate release of his parrots, Horstmann said he had imported the parrots to “assist” a breeder in Dubai. Horstmann initially declined to comment for this article, but this week called the investigation “an absolute witch hunt, possibly started by a malicious group in the industry”, because there is “a lot of jealousy”. “Extreme weather conditions” had led the breeder, a Mr Schrain, to seek alternative homes for the parrots, Horstmann’s court papers stated. Schrain “decided it would be in the best interests of inter alia the parrots” to move them to a more favourable climate. Horstmann agreed to help when he learned, “approximately during April”, that temperatures had recently exceeded 55°C in Dubai. Horstmann’s application called for the immediate release of his parrots by the South African authorities. Failing that, he asked for “immediate access” to inspect the birds, which were being held at locations unknown to him. Without taking papers submitted by the Department of Environmental Affairs into consideration – the department, due to time pressures, had filed a day late – the judge granted Horstmann’s second request. Grey parrots quickly pick up words, phrases, even ambient sounds. Certain individuals acquire vocabularies in excess of 1,000 words. But Horstmann’s parrots did not respond to him. Additional reporting by Chronicle Digital.